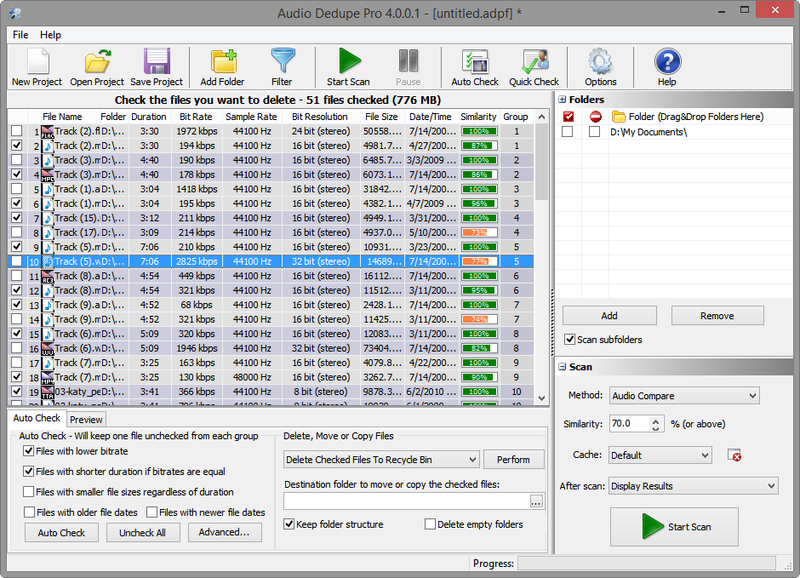 MindGems Inc. is proud to present Audio Dedupe – duplicate audio finder. A perfect fit for our innovative software collection. What is so special about Audio Dedupe? 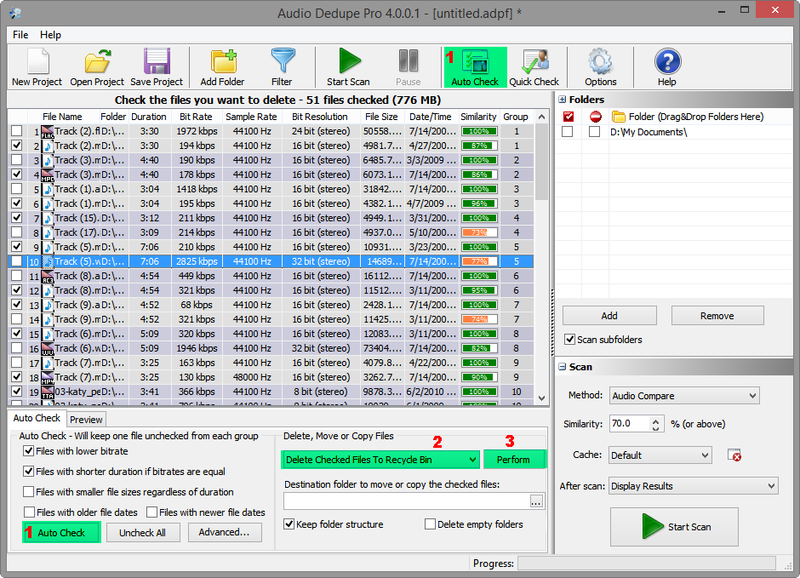 Audio Dedupe uses an innovative audio analysis technology that actually LISTENS to your audio files and can recognize two files that contain the same song even if they are sorted in different file formats. Audio Dedupe does not require ID3 tags to be present in order to find duplicate mp3 files. Why do you need Audio Dedupe? If you have a vast audio collection it is difficult to find duplicate files. Audio Dedupe will not only find the duplicates, but will also mark the ones with lower quality for deletion. An internal audio playback is also provided. You can easily compare the two (or more) duplicate songs as Audio Dedupe has a smart feature and can play the songs from the same position while you are switching between files. Having in mind that media files are usually quite large, you can easily guess that Audio Dedupe can free up a lot of disk space by removing useless duplicates. Even if you have a lot of storage space the ever growing size of media files usually eats it up pretty quickly. You can free up gigabytes of storage in just few minutes. Why shall I choose Audio Dedupe? Fast, Precise and Easy are the words that describe Audio Dedupe perfectly. Audio Dedupe can analyse thousands of audio files in just few minutes. You can easily set the similarity detection level in order to broaden or narrow the results. All duplicates are listed and grouped for easy preview. 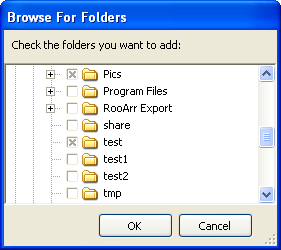 The auto-mark will let you easily select older files or files with lower quality for deletion. There are also options to select files with smaller file size, ignore certain file types from being marked, ignore files containing certain keywords in the title, ignore certain folders from being marked etc. Once you have reviewed the results you can delete the files, move them to the Recycle Bin or move them to a certain folder in order to create a backup. This entry was posted in Audio Dedupe, News and tagged Audio Dedupe, Dedupe, Duplicate Audio Search, Duplicate Mp3 Finde, Find Duplciate Audio, Find Duplicate Mp3, Find Duplicate Music, Find Mp3 on June 11, 2009 by MindGems Support.